This is SUCH a fun idea!!! When else would you get to wear your dress again?! I donated my dress to Hospice.. but dang girl, what a great idea. How fun and fabulous to get to wear your dress again. Make life a celebration!! Why not? Cheers on your anniversary and Happy Hanukkah. Best. Idea. Ever. And I had to pin those balloons. So pretty! I love it!! such a fun idea. I loved my wedding gown too! Jessica - what a GENIUS idea! My wedding dress has been sealed up in a special moisture/bug resistant box for all of eternity, or at least until my future daughter/granddaughter wants to wear it. Who am I kidding... big 80s sleeves will probably be back in style then and my dress will be SO old-fashioned, lol. What a fun idea for a party though! Love it. And I hope I can still fit into mine after 3 kids! You go girl! What an awesome party idea!!! And you look so fab in that dress it is ridiculous!!! I think that's a great idea for a party, me and my dress just wouldn't be able to attend. I want to send invites out for one just to see the looks on my friends faces thinking about having to either find their wedding dress after 25 years, or actually fit into it! Oh fun and all of the brides are gorgeous! How fun! My friends and I had one YEARS ago called "Hell yes! I'll wear the dress again!" I'm with Bliss on the "even if I can find it...it won't fit" front. Maybe a mother of the bride dress? Owww you both look gorgeous, love your dress! This is such a fun idea, now I just need to wait for my boyfriend to ask me to marry him so I can do this too! ohmigosh. I NEED to have a party like this! SOOO fun! But first: 7 more pounds. *sighhhh. * :) Your dress? STUNNING. I love it! No wonder you wanted to wear it again! this is the cutest idea ive EVER heard of. i love that you did this!!! and that dress- what a classic. you should be so proud that you fit in it and looked smashing! What a fun idea! I must admit, I look for any opportunity to wear my wedding dress again. SO FUN! best idea for a party *ever*!! I love this idea! 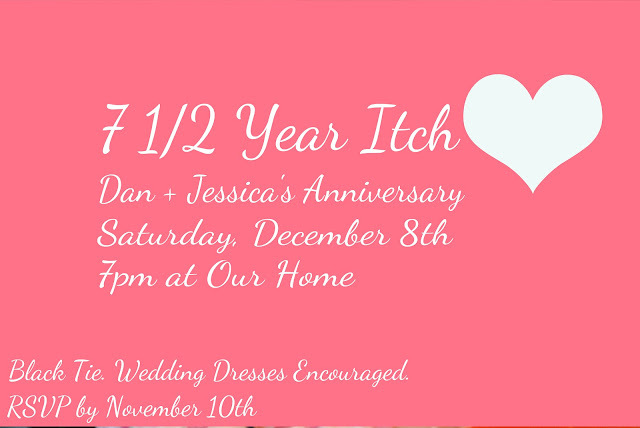 I'm going to have to see if I can squeeze back into my dress and start planning! Thanks for sharing! This such a fun idea. My husband & I just signed at the Post Office so I have never worn a wedding gown. Not even any pics to reminisce on. When we did this we had planned on doing it all over but as a vow renewal. Unfortunately, we have never been able to do so. Now I'm dying to wear a wedding dress before I turn fifty-one and I would love to copy your idea if my husband would cooperate.